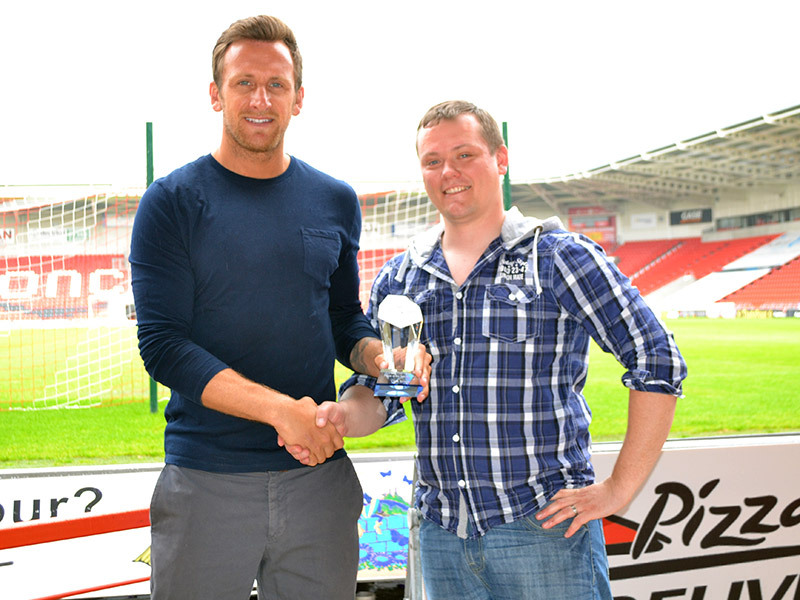 Chris Brown was awarded the Viking Chat Player of the Year 2013/14 yesterday, voted for by the Viking Chat Forum users. VSC Director Rob Williams presented the trophy. Following each match Viking Chat forum users are invited to vote for their man of the match, with each of the top 4 players receiving 5, 3, 2 or 1 points respectively. Chris had been leading the votes table for a number of weeks, and his position at top of the table was confirmed with a few games to spare, finishing ahead of Turnbull in 2nd and Coppinger in 3rd. Brown has impressed most fans and followers of the club this season with his 9 goals and relentless work rate, which has also earned him the Supporters Club Player of Year and "Star Player of the Year". Out of the nine you scored, which was your favourite goal this season? Against Sheffield Wednesday, winning us the match and a South Yorkshire derby. Which was your favourite match? What is the aim next season? To win League One again. Who do you think is the biggest rival for League One promotion next season?